Insects dying is a mundane occurrence which we often dismiss and don’t take notice. However at the Spiritual Research Centre and Ashram we started observing a unique phenomenon since 2012. When common houseflies or other insects enter H.H. Dr Athavale’s room, their movement slows down and eventually in a few hours they die. We tried to understand this phenomena further with the help of spiritual research. In conducting spiritual research, besides scientific instruments, we also use sixth sense to study and comprehend the phenomena. We have seekers with advanced sixth sense who can perceive the subtle dimension and they are able to see the entire phenomena as it unfolds in the subtle dimension. Seekers share their observations through writings and drawings. Given ahead are two such pictures based on Divine Knowledge. In these pictures, the vibrations as seen in the subtle dimension are shown. When understood through the subtle dimension, everything in this universe is comprised of three basic subtle components – Sattva (Spiritually pure component), Raja (characterised by activity) component and Tama (characterised by inertia and heaviness) component. Flies or insects are predominantly Raja-Tama in nature. The first picture explains what happens when a housefly dies at an ordinary place. 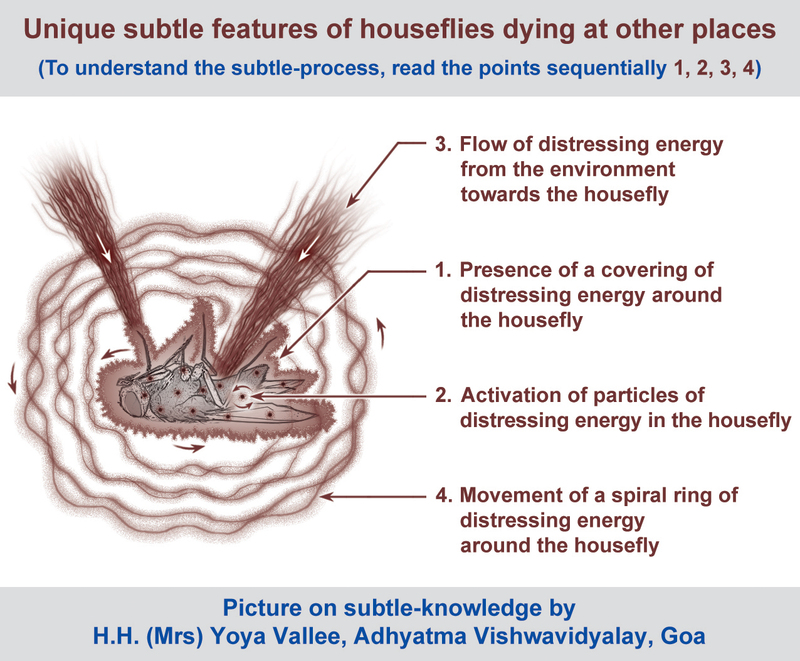 As a housefly is Raja-Tama (Spiritually impure components) predominant after it dies, distressing energy from the environment is attracted to it. As per the spiritual principle, like attracts like; meaning something which is Raja-Tama predominant or spiritually impure attracts similar vibrations from the environment. Similar was seen in the case of this housefly drawn in the picture. Distressing vibrations from the environment is attracted to the houseful and slowly forms a covering around it. This further leads to activation of distressing energy particles around the houseful. Overall spiritually impure vibrations envelop the housefly when it dies at an ordinary spot. As opposed to this when a housefly dies in a highly spiritually pure environment like the room of H.H. 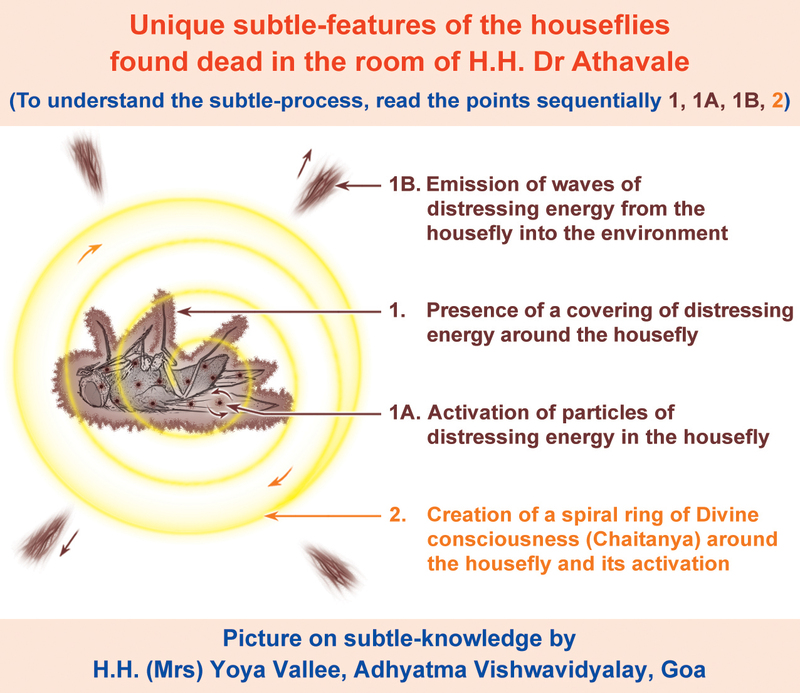 Dr Athavale who is a Saint of the highest order; the results seen in the subtle readings are slightly different. Even though distressing energy is attracted to the housefly because of being inherently Raja-Tama predominant; since it remained in a positively charged room; a ring of Divine consciousness is formed around the fly. What it means is that its subtle purification or cleansing begins to happen through the Divine consciousness or spiritual purity present in H.H. Dr Athavale’s room. This purification helps the subtle body of the fly to gain momentum in its onward journey to get elevated to the next Yoni (Next level of evolvement). So for example it is a housefly in this birth then it can take birth as a lower level animal. This is the spiritual benefit of its dying in a spiritually charged environment. The spiritual dimension which cannot be perceived through our five senses, mind and intellect affects us in many ways however as we are not aware and are not able to comprehend its impact on us. However, through spiritual practice we gain subtle ability and develop a deeper understanding about the occurrences around us. We are then better equipped to protect ourselves from negativity. It also reinforces the importance of a spiritually pure environment and when we are exposed to it how it can help us. Thus, we become more alert to have greater reverence and capitalise on such opportunities for example how to take benefit when we get a chance to enter a Saint’s room (Saint of the highest order). The Divine consciousness present in the room has tremendous power to bestow spiritual benefit. It helps not only in one’s spiritual practice but also our overall wellbeing because it disintegrates spiritual impurity. How powerfully the Divine consciousness works is explained through this subtle-picture of a fly dying in H.H. Dr Athavale’s room and how even through it is inherently Raja Tama predominant the Divine consciousness helps it to move to the next Yoni or give momentum in its onward journey.